The Big Wobble: "The humidity is just horrid," Five year drought and extremely warm ocean temperatures behind extraordinarily muggy Southern California. 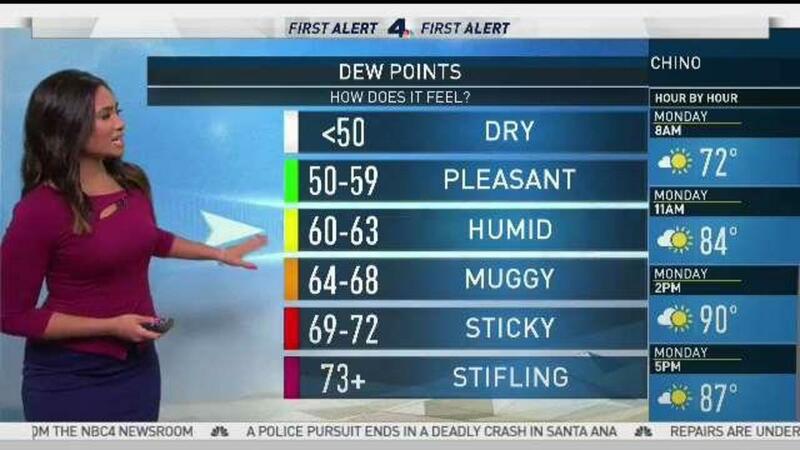 "The humidity is just horrid," Five year drought and extremely warm ocean temperatures behind extraordinarily muggy Southern California. This summer has been a muggy one, and it feels like it's been a trend the past several summers here in San Diego. "The humidity is just horrid," says Delia Pollara who is visiting from Riverside with her grandkids, enjoying the warm waters off our coast. The warm ocean waters are the main reason it has been feeling extraordinarily muggy in Southern California. Alex Tardy, a meteorologist at the National Weather Service, says the water is "warm, and it's unusually warm, even for July." Since 2013 we've seen a spike in humidity or moisture during Southern California summers, especially along the coast, which is partially related to our warmer than normal ocean temperatures at our beaches and offshore. The summer of 2013 is when we entered our drought; winters have been drier which means fewer storms and more sun. Tardy explains we're getting "too much land heat." "We're not talking a week [of land heat], we're talking years, and it's just not going away," Tardy says. This past winter ranked as the second driest on record, and besides an active winter in 2016/2017 it's been dry. Storms are good for more than just rain they create an upwelling of the ocean, acting as a natural washing machine of the ocean stirring up the water so the temperature is more evenly distributed. With fewer storms, you also have a lot more sunshine so the ocean is exposed to all that heat. Last winter was a warm one and July finished as the 5th hottest on record for San Diego, according to the National Weather Service. Something has to absorb that heat, and if the atmosphere can't, then the ocean is really good at it. Oceans absorbing atmospheric heat is normal, but when we see our oceans not able to recover, and the water stays warm, that's a problem. You know how we always say it's a dry heat? When our ocean temperatures are in the 70s, like they were in July, that directly brings our moisture levels up in what we call a dew point temperature, the amount of moisture the air can hold or the moisture that when you cool the air to that temperature it becomes 100% saturated. "You can test it with a cold soda or beer, you put it out and it starts sweating you probably have a high dew point, it's muggy. You put it out, and it's not sweating on the outside given the same air temperature it's probably because the air is really dry, like a Santa Ana wind event," says Tardy.